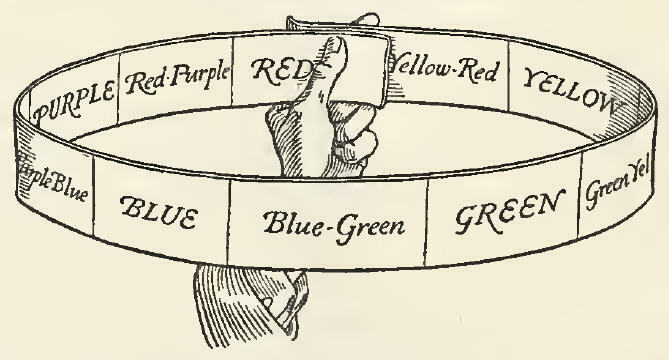 We continue with our series of excerpts from the 1921 book, A Grammar of Color. The previous excerpts covered the chapters written by A.H. Munsell himself, entitled “An Introduction to the Munsell Color System”. The next series of excerpts will cover sections of the chapter, “A Practical Description of the Munsell Color System with Suggestions for its Use” which were written by T.M. Cleland, an American book designer, painter, illustrator, and type designer. He explains in detail the definition of hue, value, chroma – the three dimension of color in the Munsell Color System. Future excerpts will include practical examples of opposite or complementary colors, balance and color combinations. So let’s get started with his explanation of the three dimensions of color and the definition of hue, value and chroma. 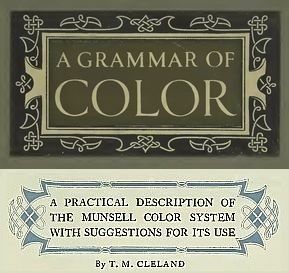 In the introductory text, written especially for this book by Professor Munsell, will be found a brief compendium of his theories upon the dimensions of color and color relations, which though generally scientific in form, is stated with such admirable simplicity and absence of scientific verbiage that it merits the careful study of all practical workers, who would understand the basic idea upon which the matter of this book is built. * It has been thought wise, however, by the publishers to augment this with a practical description with illustrations of the cardinal principles of the Munsell System, more especially with a view to its actual use in printing and advertising, or in what has come to be generally known as the Graphic Arts. In so doing, there must necessarily occur a reiteration of much that appears in Professor Munsell’s introduction, but its being expressed in different form, may tend to assist the practical reader toward a clearer comprehension. The first essential to the application of the Munsell System is a clear understanding of the three dimensions of color, and once having grasped the simple logic of these, the practical advantages of the System will be manifest. The reader should be warned at the outset against that fear of scientific perplexity which is ever present in the lay mind. The three dimensions of color are not involved in the mysteries of higher mathematics. There is nothing about them which should not be as readily comprehended by the average reader as the three dimensions of a box, or any other form which can be felt or seen. We have been unaccustomed to regarding color with any sense of order and it is this fact, rather than any complexity inherent in the idea itself, which will be the source of whatever difficulty may be encountered by the reader, who faces this conception of color for the first time. With these three simple directions of measurement well in mind, and by reference to the diagram mentioned above, where actual colors are printed, there need be little confusion for even the least scientific mind in comprehending what is meant by color “measurement.” In considering further the qualities of color, which are expressed by these three dimensions known as Hue, Value and Chroma, we will take each one of them separately in the order in which they are written, trusting that having done so we may pass to the subject of color balance or harmony and its application to every-day practice, equipped with a clear understanding of how it may be measured and noted. *It should also be borne in mind that this system does not deal with the pure science of color as wave lengths of light, but merely with color as manifested and commonly used in pigments. *In the naming of these steps of Hue, Professor Munsell has wisely adopted a terminology which is commonly understood as referring only to color, and has avoided the use of such terms as orange, pink, violet, etc., which have other meanings and might lead to confusion. What is called orange, for example, he calls yellow-red because it is a mixture of these two hues. Thus we shall have 10 divisions upon our band. The reason for this number of divisions will be understood when we come to consider the question of Color Balance. It presents a sufficient variety of hues for purposes of demonstration, and for most practical uses. Now if we bend this band around into a circular hoop, so that the red at one end meets and laps the red at the other end, we have a perfect scale of Hue in the circular form in which we shall always consider it. So it is that when we state the first dimension of a color we are merely referring to its position on this circle of hues. In writing a color formula this first dimension is expressed by the initial letter of the Hue — R for red, which is a Simple Hue, and B-G for blue-green, which is a Compound Hue. Reading from right to left, beginning at the left of a Compound Hue, the numerals run from 1 to 10, 5 always marking a Simple Hue and 10 falling always on a Compound Hue. Thus we have a series of numerals denoting any practical step or gradation between one hue and another and in writing a color formula, of which one of these intermediary hues is a part, we place the numeral, denoting the position of the hue on this scale, before the letter which stands for the nearest Simple Hue, thus 7 R, 2 Y, etc. If, for example, we wish to write the formula of a color, the hue of which is neither Red nor Yellow-Red, but about halfway between the two, we would write it 7 R or 8 R, according as it was nearer to the Red or to the Yellow-Red. This is the second dimension and is possibly the simplest to understand. It is, according to Professor Munsell’s definition, “The quality by which we distinguish a light color from a dark one.” We noted that the first dimension did not tell us whether a color was light or dark. It told us, for example, that it was red and not green, but we know that there may be light red and dark red, and it is the function of this dimension of Value to tell us how light or how dark a given color may be. 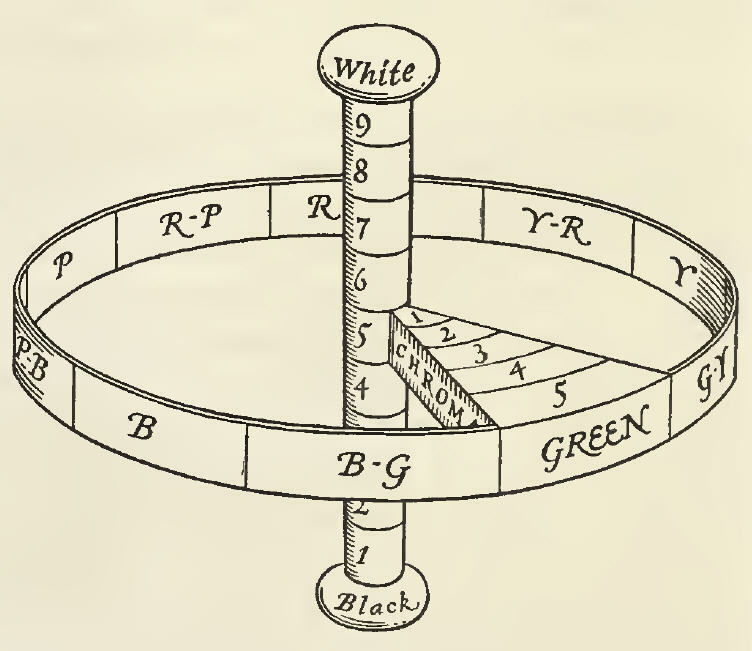 For this purpose we shall need a scale of Value, which we may conceive as a vertical pole, or axis to our circle of Hues, black at the lower end, representing total absence of light, and white at the top, representing pure light, and between these a number of divisions of gray, regularly graded between black and white. This gradation could also be infinite. Since pure black is unattainable, we will call that 0 and begin our scale with the darkest gray as 1, numbering the steps up to 9, which is the lightest gray. Pure white, which is also unattainable, we will call 10. In the practical use of the scale of Value, therefore, we shall have but 9 steps and the middle one of these will be 5 — what is referred to as Middle Value. This scale of Value, or neutral pole, is well represented on the colored diagram already referred to, where it is shown with the actual gradations printed. These steps of Value have been scientifically measured and registered by means of an instrument known as a Photometer. * In writing a color formula we express this dimension of Value by a numeral, which denotes at what step upon the scale of Value this color falls. This numeral is written above a line, as B6/ for example, by which we mean that this particular blue, regardless of its other qualities is as light or as dark as the 6th step upon the scale of Value. A color such as is commonly called “maroon” is an example of a red which is low in Value, because it is dark, and what is called “pink” is a red which is high in Value because it is light. Now having familiarized ourselves with these two dimensions, and understanding what qualities of a color they express, we may proceed to consider the third dimension, without which our description of any given color is incomplete. When we have stated that the color is blue or yellow or green and that it is dark or light, we have indicated two of its important qualities — its Hue and its Value, but we have by no means described it completely. We may say of an emerald that it is green and that it is light, but we can say that certain grapes are green and also light, and yet there is a decided difference between their respective colors, if we place them side by side. Both may be green and of the same Value of light, but the emerald is strong in color and the grape is weak in color or grayer. It is this difference which is measured on the dimension of Chroma. The scale of Value has been referred to in the convenient and easily understood form of a vertical pole, which represents a neutral axis to all the circle of hues and is, itself, of no color, but is pure gray. Around this pole we may place our band representing the scale of Hue and then if we imagine any one of these hues on the circumference of the band to grow inward toward the gray pole in the center, growing grayer or weaker in color strength until it reaches this center pole and loses its color entirely, we have grasped the idea of the dimension known as Chroma. By dividing this into regular measured steps, we have a scale upon which the strength of color may be measured. This is clearly illustrated on the colored diagram already referred to, where several steps of Yellow are shown printed on the scale of Chroma. This dimension of Chroma is written in a color formula by means of a numeral below a line, which denotes the step upon the Chroma scale at which it falls, thus /5, /8, /9, etc. Needless to say, all of the hues may be thus measured on this dimension at right angles to the vertical pole and grading from gray, step by step away from the pole to greater and greater strength of color.